If you are in the mood for a hiking vacation then you will probably want to consider the many trails in either the Great Smoky Mountain National Park in Tennessee or Rocky Mountain National Park in Colorado. Of course there are many other parks and trails throughout the United States but these two destinations offer some of the most scenic and majestic mountain vistas available. Both the Smoky Mountain National Park and Rocky Mountain National park offer different levels of trails for your hiking vacation. Whether you are taking the family for a casual vacation or are looking for more adventure and exercise in a very strenuous hike, either location can accommodate your plans. There are more than 850 miles of trails in the Great Smoky Mountains, more than enough to keep you busy for your hiking vacation. With the miles of trails available, my favorite in the Smoky Mountains is the hike to Chimney Tops. The Chimney Tops trail is a mildly strenuous hike with some incredible views. The last 50 yards is very steep, with a spectacular view at the very top. It is a 4 mile round trip that is well worth the effort. While the Smoky Mountains are exceptionally beautiful, the grandeur of the Colorado Rockies is unmatched in the continental United States. Majestic snow covered peaks rise out of the plains to reach heights above 14,000 feet in the case of Long's Peak and more than 60 other peaks rise above 12,000 feet. Within the 416 square miles of the park there are 355 miles of hiking trails. My favorite hike by far is the hike to Chasm Lake at the base of Longs Peak. The picture at the top of the page is what it looks like near the end of the hike up to Chasm Lake at the base of Long's Peak. It was taken while on one of our Rocky Mountain hiking vacations. 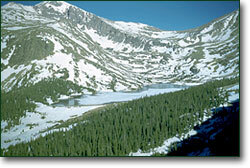 The hike is a 9.5 mile round trip that changes in altitude from 9,000 feet to almost 12,000 feet. This is a fun, scenic hike, but it is moderately strenuous, so be well prepared with food and water. Tens of thousands of people hike the trails of our national parks every year without incident and a hiking vacation can be an enjoyable and invigorating experience. However, it is essential that you are prepared for your hiking experience. This is a no-brainer but one of the biggest mistakes hikers make is not realizing the total length of the hikes they are on. If the sign at the trail head says that the hike is 4 miles, remember you have to hike back also, making that an 8 mile round trip. Don't forget food and water. While food is needed on hikes of 3 to 4 miles and longer water is an essential on every hike. Even short hikes at higher altitudes can cause you to get thirsty faster than you would think. You will also need the proper gear for hiking. I can't stress this enough, hiking boots are an essential part of a hiker's equipment just as a water bottle and back pack are. Do not try to hike a rocky trail in your tennis shoes. At the least you will have very sore feet and you could twist your ankle making the rest of your hiking vacation an unpleasant experience, not to mention getting back to the car an adventure. I have made this mistake, don't you! 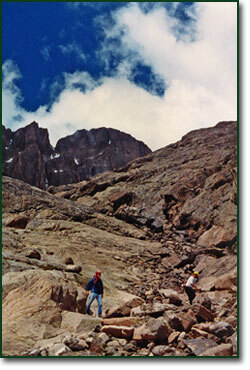 On our hike to Chasm Lake at the base of Long's Peak we wore tennis shoes on that 9.5 mile journey. My feet were incredibly sore and I went out and bought a nice pair of hiking boots the next day. Why do you need hiking boots? Hiking boots have much sturdier soles, for stepping on rocks and branches, than regular shoes and they have higher and stronger sides to keep your ankles supported helping to avoid sprains. Sierra Trading Post has a great selection of quality hiking boots for men and women. And my personal favorites are the Timberland line of boots. A backpack is also recommended if you plan on hikes more than 6 miles. You can carry food, water, a small first aid kit, a jacket, and rain gear in a small lightweight pack. You never know what kind of weather or conditions you will encounter on longer hikes. You can start out on a perfectly clear morning and encounter rain, snow or drastic temperature changes in just a very short period of time. I recommend the Coleman® backpacks for anything more than a short hike. How about a map for a great piece of hiking equipment! If you want to find that secret hike that no one else knows about, use the Atlas & Gazetteer Series, long a favorite of the outdoorsman. Choose by state. A hiking vacation can be an exhilarating experience for the serious hiker or for the whole family. You will get to see some beautiful scenery that you just can't experience by passing by in your car or RV. Plan your vacation, decide on a destination, get your equipment ready and off you go to the great outdoors.